Sushi (寿司 or 鮨 or 鮓) is much appreciated for its delicate taste and exquisite appearance. 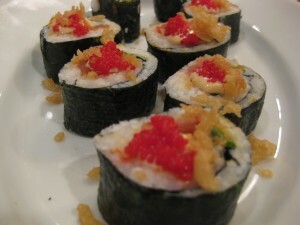 Sushi actually means vinegar-ed rice, which is the essential ingredient in every sushi recipe. Sushi is simple and cheap to make at home, needs no special equipment and is an excellent way to use left overs. Although sushi in various forms has been around for fourteen centuries, the modern version was invented in Japan in the 1800’s where a ‘hand-formed’ sliced fresh fish and vinegar-ed rice ball was eaten as a snack food. 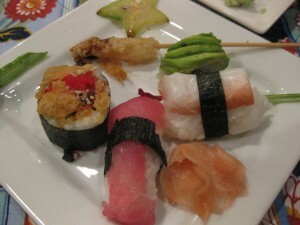 Nowadays, sushi is made with various seafood, meats and vegetables, raw and cooked. I belong to www.thedaringkitchen.com site and each month there is a cooking challenge and baking challenge. November’s cook’s challenge was to make sushi. I have a confession to make. Last week our Friday night friends were out of town so I told my husband about a new sushi place we have in town. He asked me if I had been there before and I said “yes, for lunch this week”. What I didn’t tell him was that this would be my third time to eat there that week. I wanted to sit at the bar and watch them make the sushi this time so I could get ready for this challenge. That really helped. Now, if I can just get the rice right. I won’t be posting a recipe here because if you really want to make sushi I would just google how to make the sushi rice and watch several sushi making YouTube videos. That’s what I did. By the time I had watched about 6 videos I thought I would be able to do it — and I (we) did. 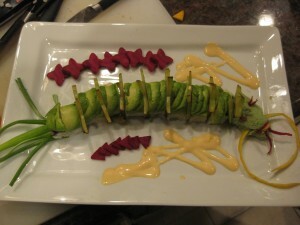 For this challenges we were suppose to make a dragon roll, spiral roll and nigri sushi. I was looking in the produce section for all our ingredients and saw a star fruit and had the idea to use this for his fins, scales or whatever it is a dragon is suppose to have on his back. Here are a few pictures of what we made last night. This was a spicy tuna crunch roll. We put chopped up tuna, sriracha hot chilli sauce, some of the crunchies I fished out of the pan from doing tempura shrimp. This was my least favorite. I didn’t care for the fake crab legs. I think next time I would do shrimp and tuna. I prepped all of our fillings earlier that day. I cut up cucumber, scallions, red bell pepper, avocado, tempura shrimp, spicy tuna mixture, spicy mayo, made some sweet soy and did some green beans in tempura for an appetizer. A plate of our night’s work. This ginger was some I bought. I did try making pickled ginger this week and didn’t like the results. I think you really need “young” ginger to make the recipe because mine was tough and string. This is my dragon roll. I used a star fruit sliced very thin and inserted it between pieces of sushi to look like fins. Of course, I’ve never seen a “real” dragon so I don’t know if they have fins or scales but I think he turned out pretty cute. I used my aspic cutters and cut shapes from a fresh beet to use as a plate garnish. I will be watching some sushi rice making videos the next time I do sushi. Hope you are up to this challenge one day soon. 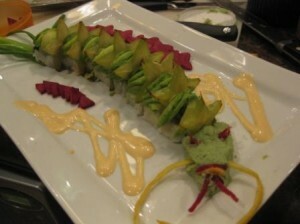 Wow that star fruit dragon roll looks so so so cute. 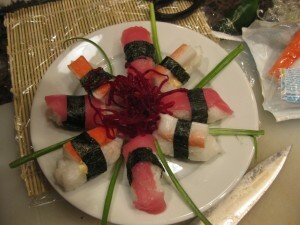 And the other sushi looks so perfect – I think you have done a marvellous job on this challenge. Bravo and that nigiri looks so luscious. Cheers from Audax in Australia. OOohh that’s one mean looking dragon! Bravo! Beautiful variety, and how creative to use the star fruit! Great job on the challenge. Beautiful looking sushi – I love your fierce dragon! Great job on the challenge! Such fabulous flavours! All of your sushi is stunning =D. Wonderful job with this challenge! wow, these look great. Great job on the rolls. Every time I make it I have a hard time cutting it so I end up eating it like a burrito. Janice, watch a couple of YouTube videos. They show cutting the sushi with plastic wrap on top.Dip knife in water with each time and take two cuts per slice — like down and back. It really works — sherry aka rosemaryandthegoat. I can’t wait to make it again. Looks really . I wasn’t able to do this challenge. OMG, so gorgeous! You looks like a pro. Well done! I love, love your dragon! That’s the best idea ever!